In its Departures column, KCET features an article on the unfinished work of creating Los Angeles State Historic Park. 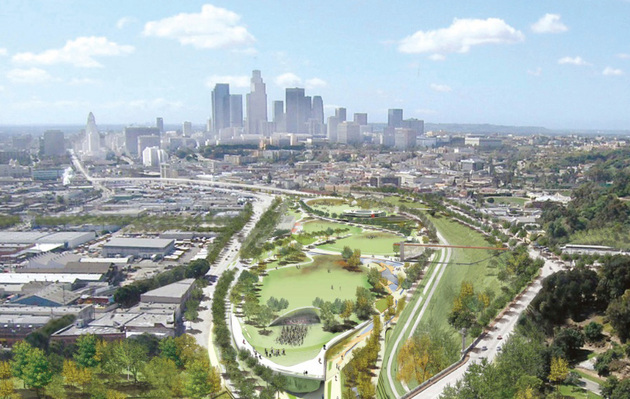 The piece tells the story of the battle to preserve as a park a former abandoned 32 acre rail yard in downtown L.A. The park is between Chinatown on the west and the L.A. River on the east and is within walking distance of City Hall and Union Station. The Cornfields, as it has become known, is also served by the Chinatown Gold Line station. In addition to public transit, part of the transportation solution is going to be businesses stepping up to help their employees get to work. Not every company can afford to do what Google is doing to reduce its transportation carbon footprint but then, lots of companies that can afford to do more to promote alternatives to the lone driver car commuter, are not doing enough. In this video, Google’s Transportation Operations Manager talks about the various transportation solutions Google is promoting. You can learn more at Google. Now if I can only convince my wife to ride the bus or bike to her job at Google in Venice. With the Republican presidential candidates sensing a political opportunity in $4/gallon gas prices, NPR’s Paris correspondent takes a look at what the French are paying at the pump. Political unrest in Nigeria and the European Union’s sanctions barring France from importing oil from Iran are the two main culprits, but a lower euro is also a contributing factor. In principal, the abundance of public transportation in France should help ease the financial pain. Though yesterday’s Blue Line delays have been covered nearly to death, I have included coverage here as well because it underscores just how important transit has become to Los Angeles. In case you missed it, a power failure at the line’s main yard caused delays on the line for much of the day on Thursday from the Imperial/Wilmington station in Willowbrook to the 7th Street/Metro Center station in downtown. Metro’s Blue Line is one of the most heavily-used rail lines in the country, moving over 78,500 people per workday.